You are here: Home / Recipes / Summer Salsa ! It’s time again for a great summer salad that works well on it’s own or as a side for any summer meal. Last week I had a two mangoes, an avocado and a red pepper in my fridge and needed to find a recipe that was easy to put together without the usual conveniences of a full kitchen. After searching for a recipe I discovered a wonderful blogger called “The Pioneer Woman” and adapted her Mango Salsa to include the ingredients I had waiting to use. 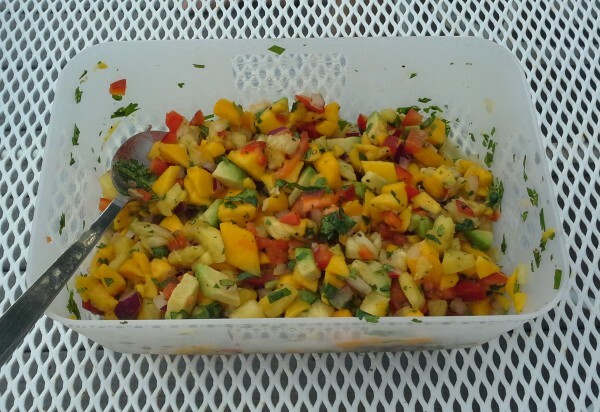 This mango salsa works great for dipping with taco chips but be sure to buy the scooper style chips as it frustrated M to have the chips keep breaking when he dipped in. We also had it as a topper on some wild Alaskan salmon that was flash frozen and yes sent all the way to Florida ! Oh and don’t forget a cold drink ! 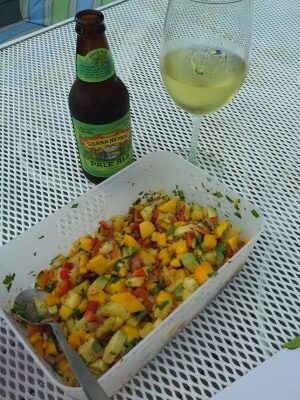 Mango-Pineapple Salsa for a warm summer night ! This recipe was inspired by a wonderful blogger called "The Pioneer Woman". All the ingredients should be fresh and not dried or from a bottle. Mix all the ingredients in a bowl and squeeze the lime over top along with the salt and pepper. Stir and let sit for at least 30 minutes in the refrigerator before serving to allow the flavours to set. Enjoy ! Also, remember to check out the Tomato and Peach Salad I posted last summer from my friend Ann and the Sante Fe Salad from my sister Judy from our trip to Mexico last April. These are all easy recipes to throw together and serve your friends with a cold bottle of beer or glass of wine. Cheers ! All my posted recipes can be found indexed under the Recipe tab as well as under their original blog post under "From my Kitchen".